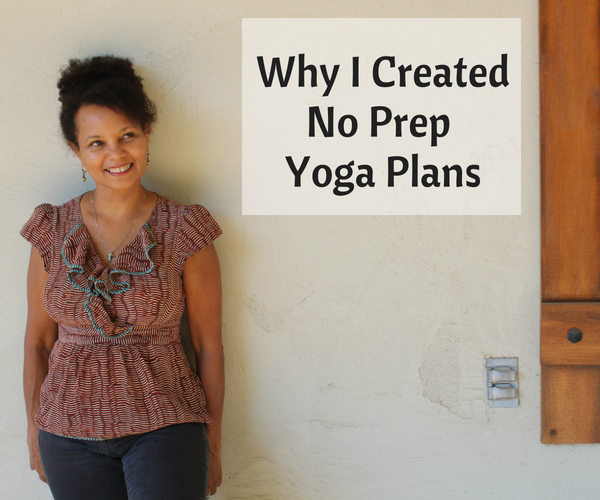 Hi, my name is Rhonda and I am the author of No Prep Yoga Plans. I’m not sure about you, but after I completed my very first teacher training program all I could think about was that I needed another yoga teacher training program, and I wasn’t alone. I didn’t feel I knew enough or was sufficiently prepared to start teaching yoga, and I completely lacked confidence. All yoga teacher trainings are NOT the same! Not the same in quality. Not the same in instruction. Not the same in the information they provide. But as with any class or course you take, some are just better than others and based upon that fact, you can feel ready, or not, to take the next step. No Prep Yoga Plans is everything I wish I had learned in yoga teacher training and more, all organized in a quick and easy format for quick reference and use. Believe me, I’m not saying that many necessary topics weren’t discussed, but it would have been so much more beneficial to have received a manual, guide, or handouts that we could reference later on. Maybe you were fortunate enough to attend a great training that truly prepared you and provided you with the materials you needed to support you in this new season in your life or maybe, like me, you didn’t. If you are in the second category, No Prep Yoga Plans can help to fill in some of those missing pieces. Also, as I state in the preface of the NPYP’s guides, I also wanted to teach a more holistic yoga class that included self-care reminders, spiritual and personal growth, mindfulness, and guided meditation, that is generally just briefly touched upon in many teacher trainings. They say that necessity is the mother of invention and NPYP was birthed to help me fill in the gaps of what was missing in my training. It includes what I needed to feel more confident in my new role as a teacher, and it has done that and more! If any of this resonates with you, you’ll love NPYPs. If you are a new teacher and need a little more support, you’ll love NPYPs. If you’ve ever desired a yoga handbook that you can use during your yoga classes, you’ll love NPYPs. If you want to create a more holistic yoga experience for your students, you’ll also love NPYPs. Try it out today! Don’t love it? We have a 30 day money-back guarantee. Also if you haven’t already, please take my survey. I’m curious now… how did you feel at the conclusion of your yoga training classes?